Chambersburg Firefighters assisted with rescuing a dog, Muzzy, from an apartment fire Thursday morning on Lincoln Way West. CFD ambulance crew placed Muzzy on oxygen, as the pup was distressed and panting, and monitored the dog while other firefighters contacted Best Friends Animal Hospital. According to the report in Public Opinion Online, Muzzy is recovering well, and the veterinarian gives credit to the oxygen therapy for aiding in a quick recovery. Later that day, Fred Denny of Invisible Fence of Chambersburg arrived at Headquarters Fire Station and donated a Pet Oxygen Mask Kit. 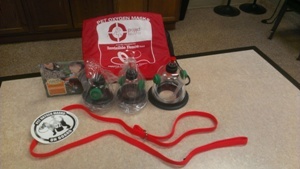 The kit contains three sizes of oxygen masks designed for pets, an emergency leash, a calming bag for cats, stickers, and an instruction video. The kit will be carried on the first due ambulance for availability in fires, carbon monoxide, and other incidents where pets might be at risk. The Department greatly appreciates the donation of this valuable resource that helps us protect our four-legged family members.